What’s one of the best ways to have fun while learning history? Museums around the country champion history through various lenses, from the stalwart Smithsonian museums in Washington, D.C. to smaller venues that showcase more targeted segments of human history. The disability community now has a museum—complete with traveling exhibits and featuring an ever-growing robust online presence—to call its own. The Museum of disABILITY History in Buffalo is much more than a collection of exhibits and impressive library of achievements of people with disabilities. In addition to documenting the role that people with disabilities have played in American history, the Museum reaches out across the country to benefit employment, social acceptance, and advocacy for people with disabilities. Through its Web site, museumofdisability.org, people from around the world can view virtual exhibits and inquire about arrangements to have traveling exhibits to come to their localities. The Museum was a natural fit for People Inc., the non-profit, which started in 1970 to address the needs of individuals with intellectual disabilities, expanded from a small grassroots organization of parents and professionals to include a wider variety of services to address the needs of people with developmental disabilities and disabling conditions in many geographic locations and numerous sites. The museum’s adept use of social media such as Facebook and Twitter allows the institution to act as an advocate for people with disabilities. For example, through the Museum’s Facebook page staffers weighed in to decry outspoken Republican pundit Ann Coulter’s disparaging use of the term “retarded” during the 2012 presidential campaign. The Museum became an active participant in the dialogue over this term and advocated for its constituency by posting a rejoinder written by a girl with Down syndrome. Such posts also serve to raise the awareness of the general public toward people with disabilities. Working at the Museum is more than simply a job for Fraser. She says, “My role as Director of the Museum combines all of my passions in life. “Having had a family member with a disability and having worked for People Inc. for five years prior to coming to the Museum, I have always been connected to disability,” Frasier explains. “I received my Masters Degree in Library Science from the University of Buffalo in 2006 and wanted to focus on rare and specialized collections.” Finding a job at the Museum put her skills and her passions together. “Being able to combine my experience and education in my current role have been incredibly rewarding and fulfilling,” she says. 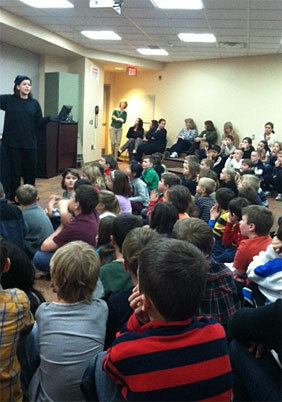 Brie Kishel, the Museum’s Education Coordinator, brings a certain zeal to her job as well. Her association with the Museum began through Kids on the Block of Western New York, another People Inc. venture. 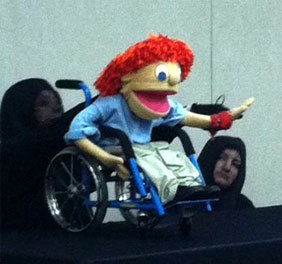 Kids on the Block originated as a puppet show featuring characters with disabilities during the push for mainstreaming in the mid-1970s, providing children a comfortable environment to discuss questions or concerns they might have about their peers. An international program with 1,700 troops worldwide, Kids on the Block is now an educational outreach program of the Museum and one of the several responsibilities under Kishel’s purview as Education Coordinator. For grades five and six, the Museum offers Disability Etiquette Program seminars, available for presentations at schools or other localities. Lesson plans for older children, grades seven through twelve, are also available for download from the online Museum. These feature topics designed to hook young interests, such as the successes and achievements of athletes, actors, and musicians with disabilities. Starting in 2013, a program in conjunction with “Dignity for All Students Act” will focus on prevention of bullying. At a Kids on the Block of WNY event, Mark Riley talks to students at Parkdale Elementary in East Aurora, NY about what it’s like to have cerebral palsy. The Museum also offers other outreach efforts aimed at the community at large, such as a recent presentation entitled “Changing Paradigms form Accessibility to Universal Design,” held in cooperation with the University at Buffalo School of Architecture and Planning. Even without a particular program, the online museum provides educational opportunities. “Our virtual, online museum offers a wealth of educational resources and tools that can be utilized in teaching younger students up to and including those at the college level,” says Kishel. Although many of the live outreach programs are generally only available in Western New York, the virtual museum opens the benefits of these programs to national and international audiences as well. Another way to expand the reach of the museum is as a model for best employment practices for people with disabilities. Through People Inc.’s People through Services program, the Museum employs a number of part-time employees with disabilities. Fraser says, “We currently have three individuals through this program. They perform various duties, currently they are serving as docent museum tour guides, working in the catalog area, and assisting with several Boy Scout and Girl Scout programs.